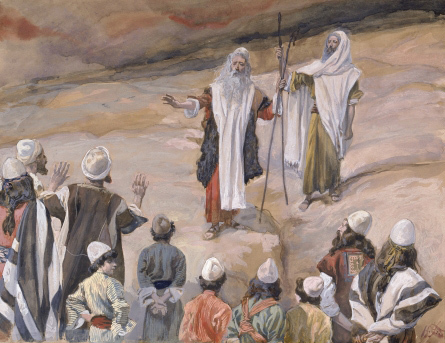 ‘Moses Forbids the People to Follow Him,’ by James Jacques Joseph Tissot. Moses may or may not have predicted that some day he would be considered one of the greatest Jewish leaders ever, but he could not possibly have imagined, while confronting Pharaoh in his royal court or leading his irascible people out of Egypt and into the Sinai Desert, that he would also be dubbed an introvert. As someone who enjoys the company of others but also has the urge to check into a library or curl up in the corner of a bookstore between back-to-back social events, I find this assertion about Moses—expressed in the 2012 book Quiet: The Power of Introverts in a World That Can’t Stop Talking and echoed later in a sermon at Manhattan’s Park Avenue Synagogue—both empowering and intriguing. Though Moses is explicitly mentioned just once in the Haggadah, discussions of the leader who played a key role in the Exodus led me to ponder my own set of questions in the spirit of Passover: Is there a connection between introversion and Jewish leadership? And can introverts and extroverts be happy breaking matzah together at the seder table? With Quiet, Jewish author Susan Cain performed a service for introverts of all races and religions, starting a public discourse on the personality trait and pointing out that introversion and extroversion mostly come down to how people best derive their energy. Simply put, she explains, introversion means that a person recharges from inwardly focused activities such as reading, writing, praying or meditating. Extroversion denotes getting a charge through external stimulation, from talking up strangers on planes to working the crowd at a fundraising dinner—or a seder filled with different personalities, which describes most seders. But was Moses really an introvert? I love Cain’s description that in the process of bringing the Ten Commandments to the Israelites, he was “using all the strengths that are classically associated with introversion: climbing a mountain in search of wisdom and writing down carefully, on two stone tablets, everything he learned there.” But I also am uneasy about retrofitting contemporary terms to biblical figures. That is exactly what Swiss psychologist Carl Jung observed in the early 20th century, when he devised his personality-type theory on introverts and extroverts and how people derive their energy. Both he and the mother-daughter team of Katherine Briggs and Isabel Myers—who sought to codify Jung’s theory by developing the Myers-Briggs Type Indicator to evaluate personalities, particularly in the workplace—were clear in their assessment that introversion and extroversion are equally respectable personality styles. Introverts are not necessarily timid, withdrawn or anti-social. They can enjoy attending parties, large functions and business meetings. They also head prominent companies and take active roles in the public sphere, as exemplified by Facebook founder and CEO Mark Zuckerberg and Albert Einstein, whom Cain includes in her book. And like all people, the one in three of us who claim this personality type have the capacity to adapt, grow, change and learn to play to our strengths—as Moses did over the course of his journey in the desert. Solitude is also energizing for Dov Eden, a leading organizational and industrial psychologist and professor emeritus at the Coller School of Management at Tel Aviv University. While playing down his contributions as a leader in his field, even though he has published widely (and has been quoted by Cain on her Quiet Revolution website), Eden is not at all reluctant to say he is introverted. “Give me a book and a folding chair [at the beach] and I’m happy,” he says. In the end, the question of how to characterize Moses doesn’t matter as much as recognizing that we in the Jewish community have benefited from and can continue to find inspiration and guidance from leaders who embody the positive traits that people associate—rightly or wrongly—with introversion. “Certainly, in the rabbinic tradition, our sages spoke of the virtues of silence, humility, thinking before you speak, not imposing your will or your agenda on others,” Breitowitz, the Torah scholar, says. introverts to reflect on topics of freedom, faith and responsibility as well as loud and lively discussions on big themes and small to keep extroverts happy. We can all approach Passover, the holiday of freedom, by allowing ourselves the freedom to be who we are and not limiting ourselves by test scores or stereotypes. We can identify as introverts or extroverts if we want to—or even better, as unique individuals with an assortment of character traits as dense, rich and layered as a box of Passover chocolates. Marla Brown Fogelman is a writer in Silver Spring, Md. This is a wonderful perspective you ask us to contemplate. As a teacher I can picture students who are introverts and do wonderful things, but who also might ‘slip through the cracks’ as their peers clamor for attention.